I woke up this morning at 5:30 when the cat settled onto my shoulder, his black, fuzzy face just inches from mine. I reached for my phone and pressed the weather app. 27 degrees (-3Celcius)! That's practically a heat wave considering that I ran on Tuesday morning and it was 7 degrees (-14Celcius). The app warned that snow or freezing rain were forecast for 7 a.m.
By the time I got out of bed, dressed and was dancing in the kitchen to Pitbull's "Time of Our Lives" before I headed out the door, it was 6:30. As I headed down the walk, I felt a few thick drops hit my face and my lashes. Snow or rain was starting, but the roads were clear, so I joyfully ran about a mile and a half before the snowy mix increased. Soon, my hair was dripping and my fleece jacket hung heavy on my shoulders, but still, I was sweating from the run. I stopped inside a bus shelter and pulled my fleece off, tying it around my waist. I headed back toward home, feeling the icy material sticking to my thighs. The black asphalt was shiny in places and I wondered whether I might slip. But each step felt fairly secure. Then about half a mile from home, I felt a foot slide before the other one found a secure anchor. I stopped running and slid my feet along the street. Yep, solid ice. I headed for the sidewalk, figuring I'd walk the rest of the way home. But the sidewalks were even more slippery, and as soon as I started walking, I felt the wetness of my clothes on my skin, the temperature still hovering around 27. Without the body heat from running, I felt sure I would soon succumb to hypothermia. This was one of the first times that I felt like I had truly put myself in danger: soaking wet, 27-degree temperatures with icy roads. There was nothing to it but to continue running in the hopes of keeping my body temperature up and getting home sooner. So I headed back to the road. I changed my running stride. Rather than a lope, I was nearly running in place, bouncing up on each step then landing just inches in front of where I'd left. I was afraid to stretch out, picturing me ending up in a split if my front foot slid. Finally, I made it home. As I had run, I had come up with a plan. I knew that I couldn't hop into a hot shower with my skin so cold. I've experienced that burning and itching before. But I couldn't stay in my wet clothes. Luckily, I don't work until the evening today, so when I got home, I stripped off all my clothes, hung them on the clothes hamper and climbed into bed under the covers. I stayed there for at least half an hour, until the skin on my stomach and thighs didn't feel cold to the touch any more. By the time I finished a hot shower and got dressed, I was nearly human again. Earl texted me from his walk to the bus, "It's dangerous." 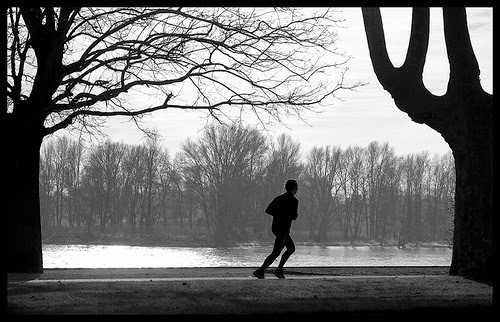 I love running, but I know I need to be more aware of my surroundings and the weather before I take off in the mornings to enjoy an unfettered run. Liv Halston holds tight to the guardrail of the Eiffel Tower, looks down through the diamond-strung wire at the whole of Paris laid out below, and wonders if anyone ever, has had a honeymoon as disastrous as this one. Around her families of tourists squeal and duck back from the view, or lean against the mesh theatrically for their friends to take pictures, while an impassive secrity guard looks on. A glowering clump of storm clouds is moving toward them across the sky from the west. A brisk wind has turned her ears pink. 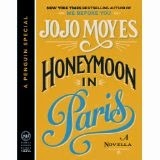 It's a lovely escape to Paris with two honeymooning couples, one during 2002 and the other during 1912. The 1912 couple is the painter Edouard LeFevre and his shop-girl wife, Sophie, who was also his model. One of the great things about being a Francophile is that there are so many other people who love France too. It's fun to make connections with them, to live vicariously through them, and to have them share my experiences too. Mostly, I do that through my blog, and my novels, but today I made a discovery on Pinterest. There's a whole section called France full of people who are hankering for some Francetime, just like me. My friend Sheila convinced me that I should join Pinterest to promote my books. She's on Pinterest because she's very crafty and also does interesting things with foods. I'm sure there are ways to promote my books on Pinterest, but I immediately got sucked into the France world. I've created one "board" that's called "Places to Visit in 2015." I put a map as the background and pinned 4 different places on it. I attached pictures to each place. Two of the places, I've never visited, so I could choose pictures from Pinterest. Two of the places, I've been before, so I uploaded my own pictures. I'm not sure what to do with it now, but I guess we'll see what happens. But the most fun will be looking at the things other people have posted. When I typed in "France," the screen that came up was full of exciting options about France. Many regions of France were represented too. Okay, sorry, I'm back. After I posted that picture and the link, I went back to Pinterest and kind of got caught up reading the articles. And one of the new French words I learned was "hop," which is pronounced "up" and basically is used where we might mutter "okay" to ourselves. See how handy Pinterest is going to be, if I don't spend all my time reading the articles. Hope everyone else has something lovely to share about France. Thanks for visiting and for leaving a comment. 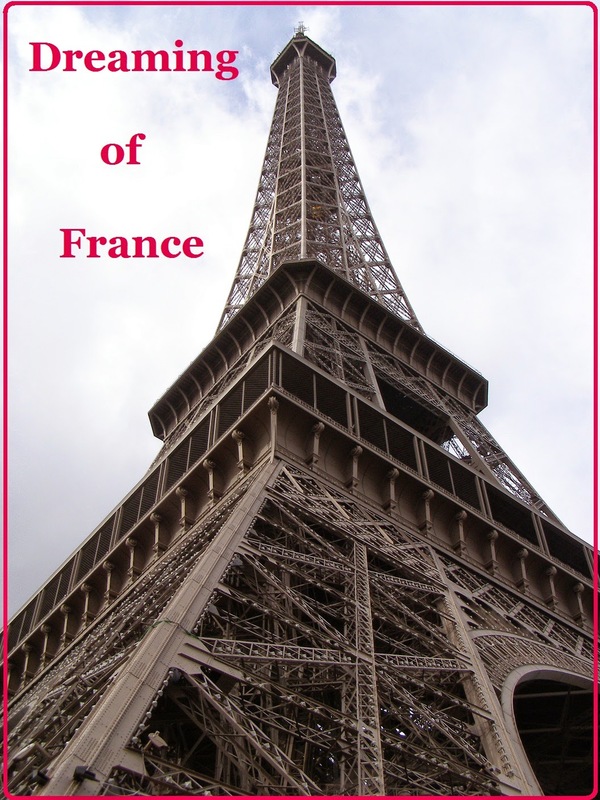 Please stop by the blogs of the others who share on Dreaming of France. It's nice to know that, after nearly 25 years of marriage, I can still make my husband laugh. But the joke began a few days ago. From within the house, I heard a repetitive whining noise. "What is that?" I asked Earl. He walked to the back door and saw a squirrel perched on the edge of the porch calling out. "Maybe he's mad that there's no bird food on the ground," I suggested. "Too bad we don't have any thing to feed him," Earl said. We pondered the squirrel food question for a few minutes before I remembered the peanuts in the cabinet. Earl opened the door and threw some peanuts underneath the bird feeder. 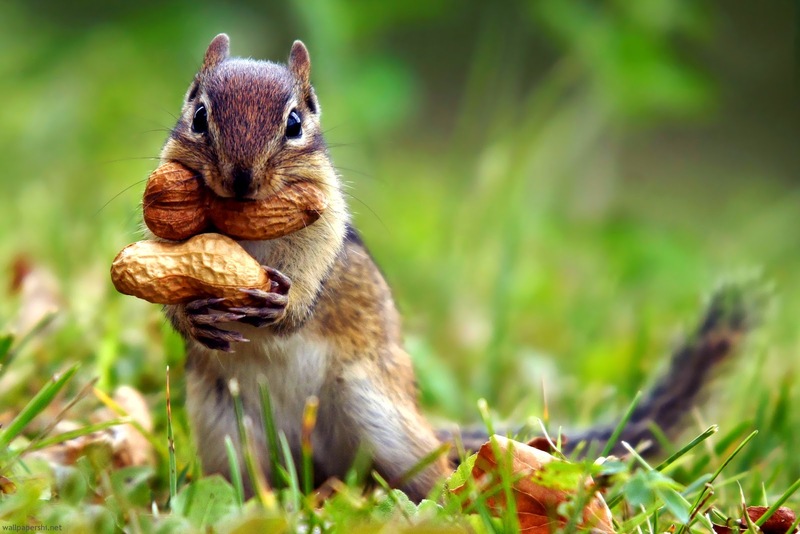 The squirrel, of course, ran away, but eventually made his way back to the grass where he gathered salted peanuts. After that, the squirrel was a regular feature under the bird feeder. I'd see him every time I went out the back door to the garage or on a walk. Tuesday morning I was headed toward the garage with Earl on our way to work and the little squirrel looked up expectantly. "Hey Squirrelfriend," I said, in that voice you would say "Hey, girlfriend!" And it cracked up Earl. Every time I saw him for the rest of the day, he would shake his head and say, "Squirrelfriend." This morning as I listened to Marketplace Money on my local NPR station, I heard a story about how anticipating a vacation is almost better than the vacation itself. A study in the Netherlands found that people were happier right before a vacation than right after. The promise of the reprieve might be better than the actual trip! Nothing can go wrong as you are dreaming about it, but in actual travel, many things can go wrong, explained the author of the study who was attacked by a shark in Hawaii. 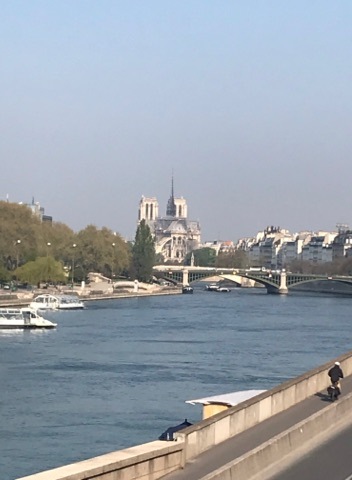 I don't fear shark attacks on our next trip to France, and I am enjoying the joy that comes with contemplating walking off the plan in Paris and traveling by train down to Aix en Provence. I Skyped last week with a blog friend in Aix en Provence, Delana (who hasn't been blogging much but who runs Travel Solo Bootcamp, was full of fun ideas for me and Earl. One of the things she told us was that the Calanques, between Marseille and Cassis are open to cars during March. 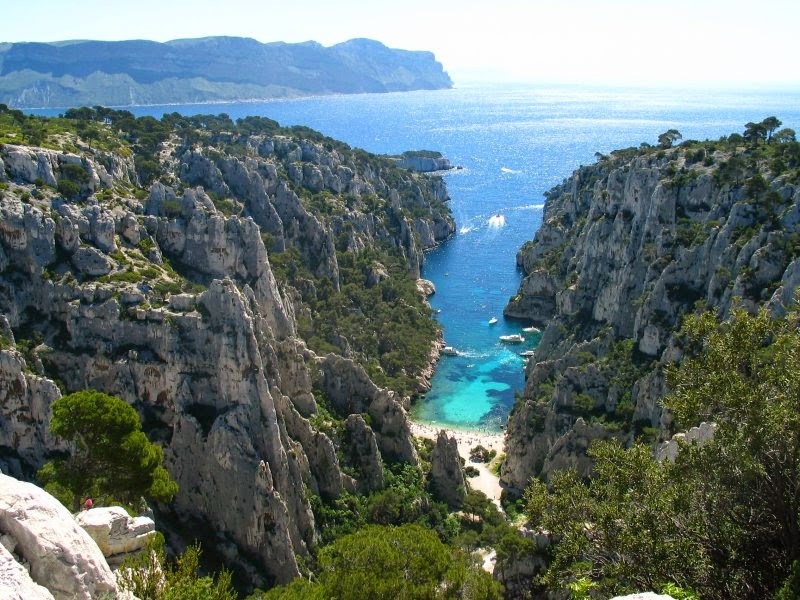 That means that we can drive our rental car on the calanques, a kind of Mediterranean fjord. Most of the time, people visit them by boat or they have to park and hike in to see them. This photo comes from the Alaric English Speakers website. Delana explained that the roads are twisty through the steep landscape. Other articles explain that creeks cut into the stone leaving these dramatic shapes. Then the creeks pour into the Mediterranean, leaving the water pure and fresh. I wonder if we'll get any photos as dramatic as this. I'm really dreaming of France and looking forward to our adventures. What are you dreaming about this week? Please leave a comment and visit each other's blogs to see what others are posting about. On my run this morning, through the dark, wet streets of my small town, a shop window caught my eye. The shop is a florist that is also filled with furniture and other household items for sale. It wasn't simply the white wicker furniture with the red and black flannel cushions, or the white bureau that held folded blankets, making the window look so inviting. It was the peaceful black cat, curled into the cushion, as if he'd been chosen to match the soft flannel. The cat regarded me without alarm or interest, but he didn't tilt his head toward the light so I could get a better shot of him. I love the idea of pets in local shops. But I hope he wasn't lonely over night. I know that my cats like to cuddle up in the fold of my knees at night, stealing my warmth and adding to it too. Sometimes, social media gets me into awkward situations. I blog, I'm on Facebook, I have a Twitter account and people keep following me even though I don't know why because I rarely tweet. You'd think that I am fairly savvy about technology. But I can't tell you the number of times I've called my daughter Grace to say, "Fix it!" I've usually posted something I didn't mean to or been tagged in a photo that I don't like or made some sort of awful editing error that will not look good for a writer. One day, as Grace and I were looking at something on Facebook, she clicked on my profile and said, "Why is this pending?" It was a request from Earl to confirm that we are married. I mean, of course, we are. We've been married nearly 25 years. I hadn't seen his request and had no idea when he sent it. Originally, when I was using my Facebook page as an author page, I didn't include anyone in my family settings. 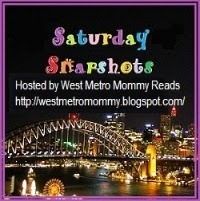 As you know if you read my blog, I talk about my kids and their exploits. I didn't want to reveal to the world their last names, preserving them a tiny bit of anonymity. But, now I have a separate author page, and I try to limit my personal Facebook page to friends and family, so I could safely acknowledge my husband on my Facebook page. The only problem was, the day that Grace pointed out that I hadn't acknowledge the marriage request, well, Earl and I were in the middle of a fight. It was only a few weeks ago, but I can't remember what the fight was about (of course). I told Grace I couldn't possible accept his request now because that would be a conciliatory act in the middle of an argument. The fight faded, but I didn't remember to go on Facebook and add Earl as my husband. The other night when Earl was on his Facebook page, he clicked on his profile. "Why is this pending?" he asked. "Oh," I laughed and told him the story about seeing it when we were in a fight. He immediately pretended to be affronted and protested that I didn't need to acknowledge him if I didn't want to. "I can't do it from my phone," I explained. My computer was all the way across the room. But I updated my profile, typing in Earl's name as my husband, since I couldn't accept his request on my phone. Now, our marriage is no longer pending. 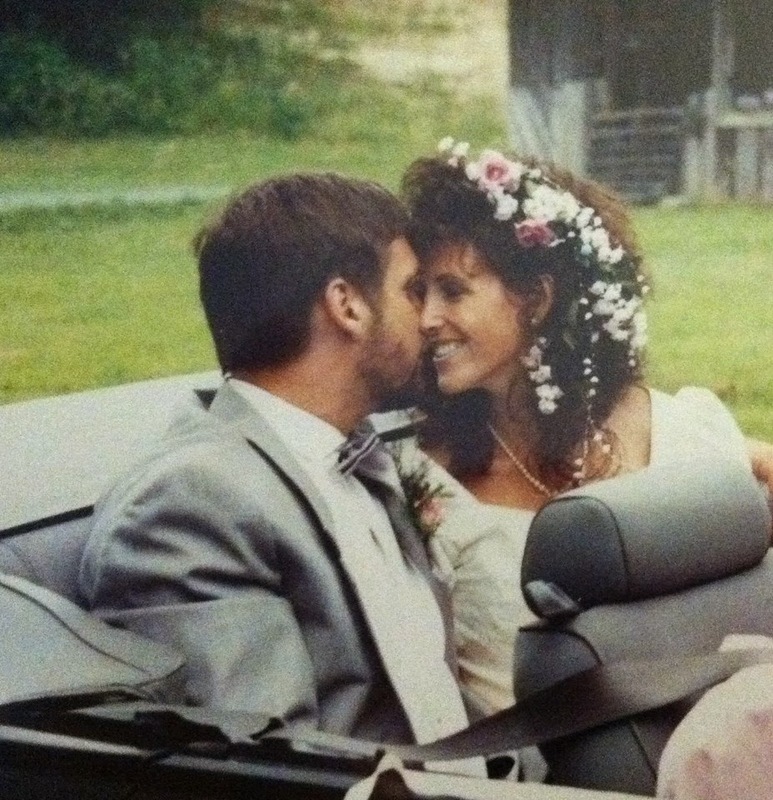 Facebook does believe that we were married in 2011 rather than in 1990. 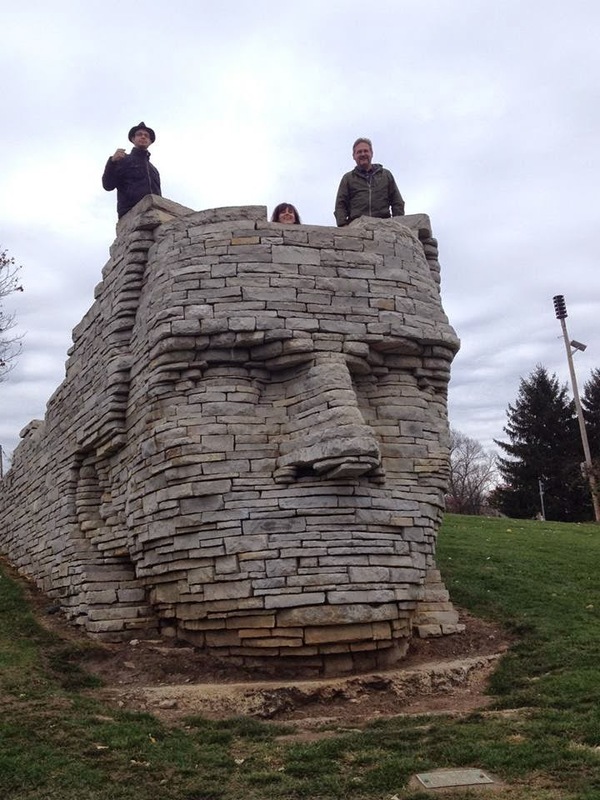 And if you were to click on the marriage statement, you'd see some pretty strange photos of me and Earl, like one of us standing on the top of an Indian head statue, Tecumseh, and accompanied by a French friend. Plus Earl's comment, "Beautiful day, beautiful bride." People must think, "Is this where they got married?" But his comments go with another picture and another post. Like I said, it's all very complicated. Very bizarre, but you can't always fix social media. Here's an actual photo as we were driving away from Mom and Dad's farm to the reception. I have another book set in Paris that I'm preparing to start reading. 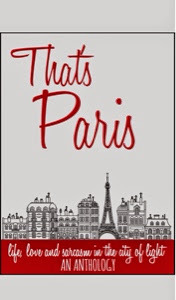 I'm looking forward to it because author Vicki Lesage, whose hilarious memoirs I've enjoyed, helped create this book with short stories set in Paris. The book is called That's Paris life love and sarcasm in the city of light. The book is scheduled to be published on Feb. 2, but it's never too early to start anticipating it. I'm skipping forward to a story by Vicki to share with you because I know I'll enjoy it. Here's an excerpt from "Signs, Sign,s Everywhere Signs:"
I didn't mean to complain. I was grateful for the heaps of wedding presents I received before The Big Day even arrived. I'd be marrying Monsieur Perfect in one month's time, and my American friends and family would descend on Paris en masse for the occasion. I wanted to wrap up as many odds and ends as possible before they overtook the city - and my normally tres organized life - for one week. Number one on my list: writing eleventy thank you notes. Never mind my chicken-scrawl penmanship or the fact I hadn't handwritten anything other than our exorbitant rent check recently. The primary pain in my derriere was getting my out-of-practice hands on some damn thank you cards. It was August, and except for the occasional tumbleweed and busload of tourists, the residential streets of Paris were deserted as Parisians took their annual month-long vacation. The neighborhood papeteries had closed their ancient doors, leaving me no choice but to trek to Auchan, the French megastore that's just like Target, except it's full of la merde and you usually leave empty-handed and broken-hearted. So, actually, nothing like Target. I can't wait to go on this Parisian adventure with Vicki, along with the other authors included in this anthology. I look forward to seeing what you are sharing about France this week. Thanks for playing along and please visit each other's blogs too. 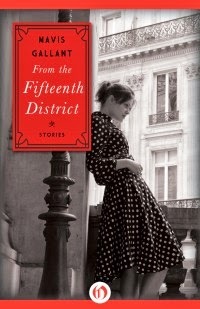 Today I'm reviewing From the Fifteenth District by Mavis Gallant. This is a series of short stories, some in France or Italy or Germany, all those western European countries that we Americans love to visit, soaking up the culture. But Gallant goes far beyond the surface of these countries and people who we so admire. The short stories are set around World War II, some of them occurring before, some after or during. The stories aren't about the war though, but often the characters are affect by the war. Each story is like peeking into someone's window and seeing the real them, the one they might hide from the rest of the world. The black and white cover is foreshadowing of the stories to come as they definitely have a melancholy feel throughout. The richness of Gallant's words only deepen the effect. "Mussolini is trying to get away from those oversized families," said Mrs. Unwin with confidence.. She sat on a high stool, arranging flowers in a copper bowl. She quashed her cigarette suddenly and drank out of a teacup. She seemed to Carmela unnaturally tall. Her hands were stained, freckled, old, but she was the mother of Tessa and Clare, who were under three and still called "the babies." The white roses she was stabbing onto something cruel and spiked had been brought to the kitchen door by the chauffeur from Castel Vittorio. This time he had given Carmela a diffident nod. Gallant delves into each character, revealing things that we might prefer not to know, wanting to engage only with the surface beauty but realizing the complexity of each person, no matter their nationality or position during the war. We meet a German prison of war home long after the war had ended because no one thought to send him home from France He finds his mother remarried and very changed. We meet a Jewish man who blessedly escaped Europe before the war and returns in search of an heir for the business he has built in Argentina, but it has to be the right kind of heir. The boy, now a man, is repelled by the uncle who escaped the atrocities. But I haven't. Maybe it's my indecision. I have three books in the works. I can't figure out which one to run with. generally come in at 80,000-100,000 words. The novel is about Maeve, a 32-year-old agoraphobic who decides to change her life through feng shui. Hopefully, it's humorous women's fiction as this young woman figures out how her life went awry and what she needs to do to get it on track. But this book is really confusing me. It doesn't have a clear plotline. So I've farmed it out to Angie and Emily who will hopefully read it and give me direction as to which way it should go. words written. It's the one about Sadie, a divorced mom, whose 17-year-old daughter Scarlett runs away to Paris, chasing the French exchange student. Sadie decides to go after her and discovers something many people learn in Paris. Life is to be lived, not tolerated. I'm kind of stuck on this one because I need some color and scenery from Marseille, and I've never been there. But I will be there in two months! a photo from Virginia's blog Paris Through MyLens. Finally, Autumn in Aix has about 35,000 words written. It is a sequel to my first novel The Summer of France. Fia is still in Aix en Provence running a bed and breakfast with her great aunt and uncle and raising her teenage twins in a new culture. She's surprised to find herself lonely for friends; she's helping her twins adjust to a new society, when she meets an American tourist with Iranian heritage who is visiting France for suspicious reasons. Can she protect France's art treasures with the help of Frenchman Christophe, who has given up the family business of black market art dealing to work with the French government and the Louvre at retrieving art. So those are my three choices and I've been frozen in indecision. I've read through a couple of them. I liked the start, but it didn't inspire me to immediately write more. I often say that it's too hectic around my house to get anything done with all three kids home, but even when everyone is asleep, I find reasons to get up from the table and do something else other than writing. Maybe I need a regimented schedule to inspire me. This week, I started teaching again at one college and the other one begins next week, so between the two, maybe I'll realize how precious writing time is and I'll get to work. I'd love to hear which, if any of these books catch your attention. I'm hopeful to launch a novel in 2015, maybe two! This week I'm reading a book for FranceBookTours and I'll have the full review on Sunday, Jan. 11. 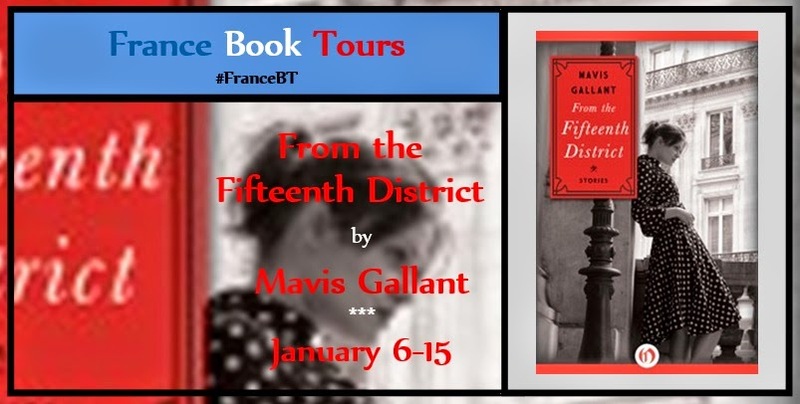 From the Fifteenth District by Mavis Gallant is literary fiction, short stories, set mostly along the Cote d'Azur of France, near Italy. The school Carmela attended for much of six years was founded by Dr. Barnes, a foreigner who had no better use for his money. It had two classrooms, with varnished desks nailed to the floor, and steel lockers imported from England, and a playing field in which stray dogs collected. A sepia picture of the founder reading a book hung near a likeness of Mussolini. The two frames were identical, which showed the importance of Dr. Barnes -- at least in Castel Vittorio. Over their heads the King rode horseback, wearing all his medals. To one side, somewhat adrift on the same wall was the Sacred Heart. After Carmela was twelve and too old to bother with school anymore, she forgot all the history and geography she'd learned, but she remembered the men in their brown frames, and Jesus with His heart on fire. She left home that year, just after Easter, and came down to the Ligurian coast between Ventimiglia and Bordighera. She was to live with Mr. and Mrs. Unwin now, to cook and clean and take care of their twin daughters. Tessa and Clare were the children's names; Carmela pronounced them easily. The Unwins owned a small printing press, and as there was a large Anglo-American colony in that part of the world they never lacked for trade. They furnished letterhead stationery, circulars, and announcements for libraries, consulates, Anglican churches, and the British Legion -- some printed, some run off the mimeograph machine. Mr. Unwin was also a part-time real-estate agent. They lived in a villa on top of a bald hill. Because of a chronic water shortage, nothing would grow except cactus. An electric pump would have helped the matter, but the Unwins were too poor to have one put in. Mrs. Unwin worked with her husband in the printing office when she felt well enough. She was the victim of fierce headaches caused by pollen, sunshine and strong perfumes.. The Unwins had had a cook, a char, and a nanny for the children, but when Carmela joined the household they dismissed the last of the three; the first two had been gone for over a year now. From the kitchen one could look down a slope into a garden where flowering trees and shrubs sent gusts of scent across to torment Mrs. Unwin, and leaves and petals to litter her cactus bed. An American woman called "the Marchessa" lived there. Mrs. Unwin thought of her as an enemy -- someone who deliberately grew flowers for the discomfort they created. I look forward to seeing what you are reading. After nearly five years away from France, I'm finally returning. It's only for 10 days, but I'm ecstatic at the idea of once again immersing myself in French culture. Every picture someone posts from France, I think, I can see that myself very soon. We'll be traveling to the South of France, so for only three days we'll be in Paris. We've seen most of the main tourist attractions. What should we see or do in Paris? Earl says he wants to visit a jazz club. I think I'd like to do a tour or class with a chocolatier. Now I'm counting on you all to direct us to the best off-the-path places to visit or take a tour or to sit and drink in the wonderful ambiance that is Paris. Thanks for playing along with Dreaming of France. Please leave a comment and visit each other's blogs too. You never know when you'll find something new to fall in love with. 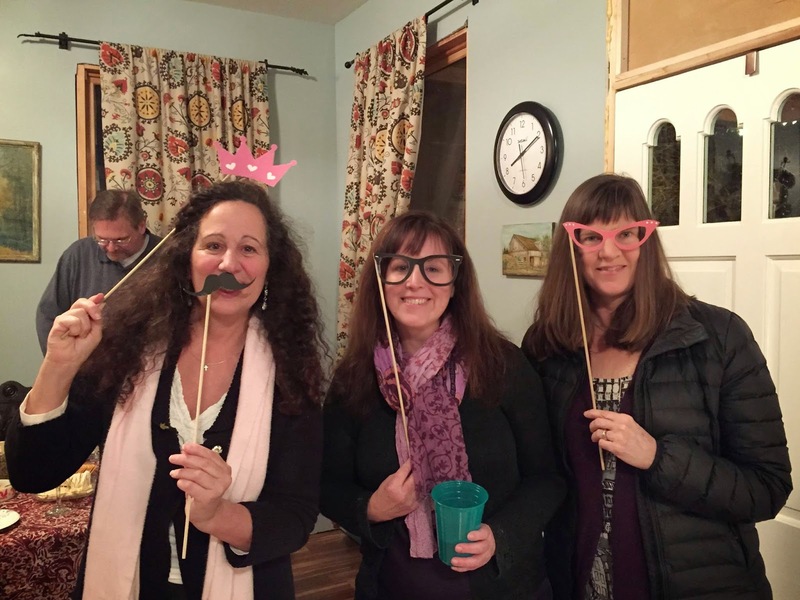 I don't know how my book launch slipped past without a blog post, so I am revisiting the fun and frivolity we had there. It was in early December when my friend and marketing manager Najah convinced me that I should have a book launch for Trail Mix. 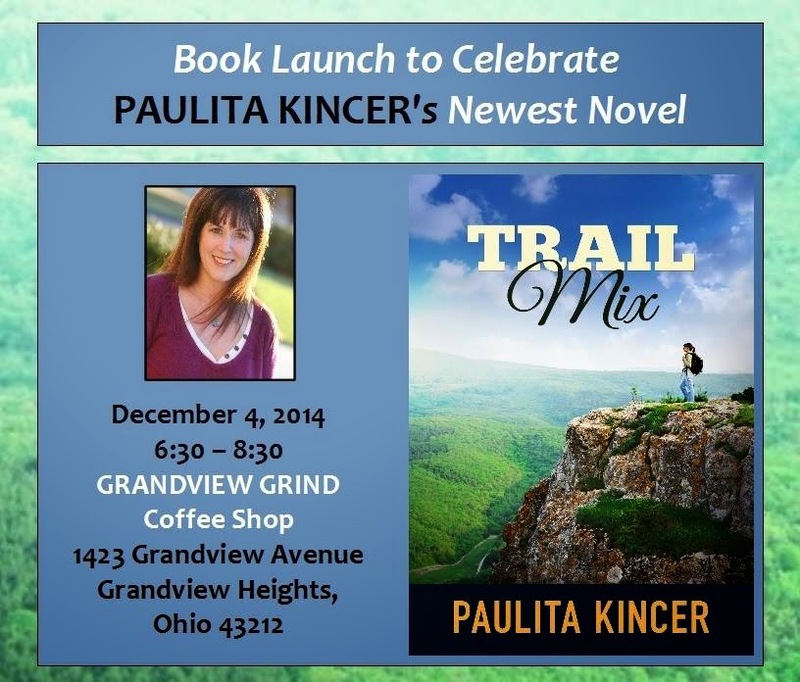 I'd never had a book launch for my other novels, so this was new to me. Luckily, the owner of a local coffee shop, The Grandview Grind, offered her place free of charge and we set the night. I brought in wine, cheese and crackers, chips and some local specialty pizzas to assuage the hungry crowd. 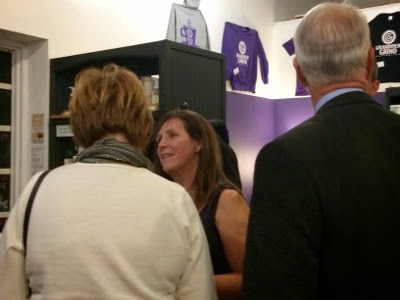 The whole time leading up to the book launch, I was verrry nervous. I hate for something to be all about me. 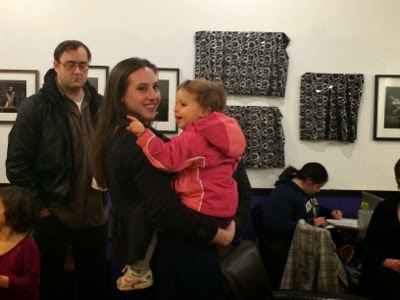 Most people, including my husband, would not guess that I would feel shy or embarrassed to be the center of attention, but I do. I didn't want to feel like I was extorting people to attend an event and buy a book. I only wanted it to be a celebration of the novels I've written. 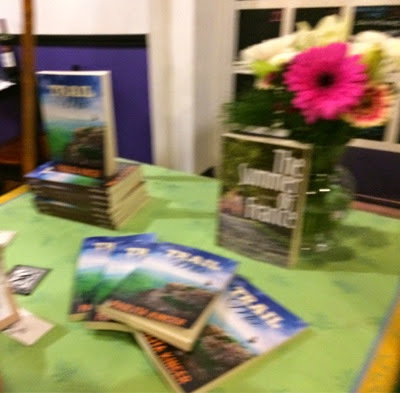 At the prodding of both Najah and my friend Leah, I had a table with copies of Trail Mix, along with a few copies of my other novels, The Summer of France and I See London I See France. When people began to arrive, both those I knew and those I didn't, I felt humbled and amazed. 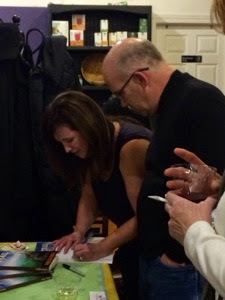 And yes, people did buy my books and I spent the night signing copies. I should definitely have come up with some sort of catch phrase. My most common one was "Enjoy the adventure!" which is something that I mean about both life and my novel. I did get to enjoy spending time with friends from so many different sections of my life, and my friends were delighted to meet the other friends they'd heard so much about. 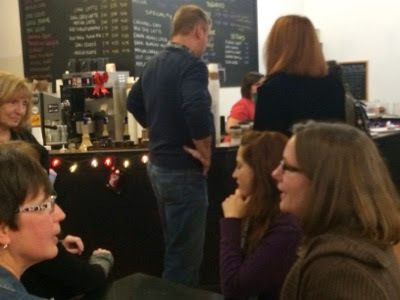 My homeschool friends met my running friends who met my coffee shop friends who met the local relatives too. And Grace had a whole other section of friends who came, mostly because she's so persuasive. 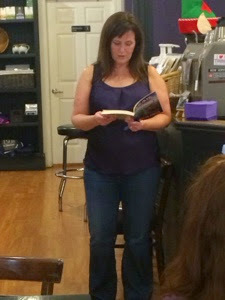 After a lovely introduction from Leah, I read from the Prologue of my novel. I'll have to work on that too. Maybe I should pause longer at places where people are supposed to laugh. In the end, I got to drink a glass of wine and spend time with friends, and I had only one book to carry home with me. Next time, I'll know better what to expect, and I plan to have a blow-out book launch. Isn't it funny, all the separate holidays that we have based on religion or culture, but New Year's Eve is one that we all can celebrate around the world, of course, at different times depending on our time zone. And yes, I know that some cultures have separate calendars so different new years, like the Chinese, but really, all around the world we celebrate on Dec. 31 as a new year begins. I like being united with everyone. 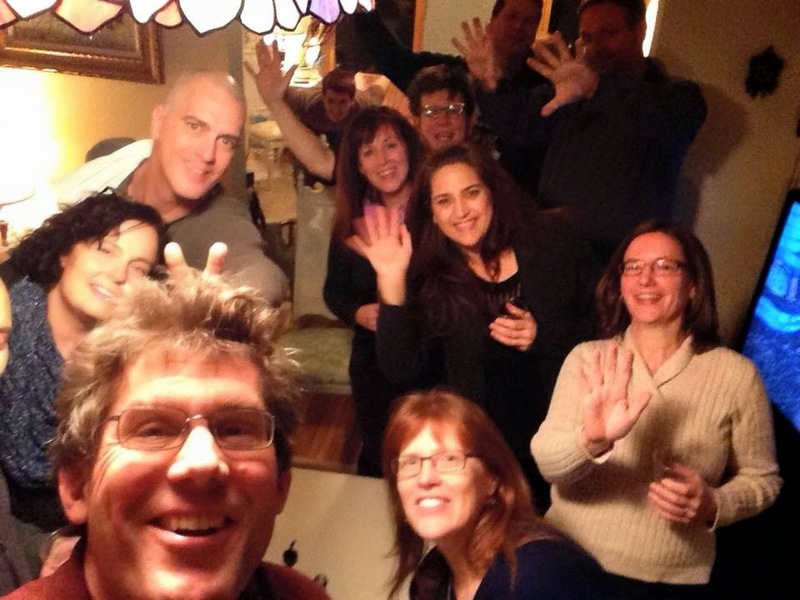 We had a terrific party at my friend Sheila's house. She throws the best parties whether New Years or Fourth of July. Here are a couple of pictures of us celebrating. 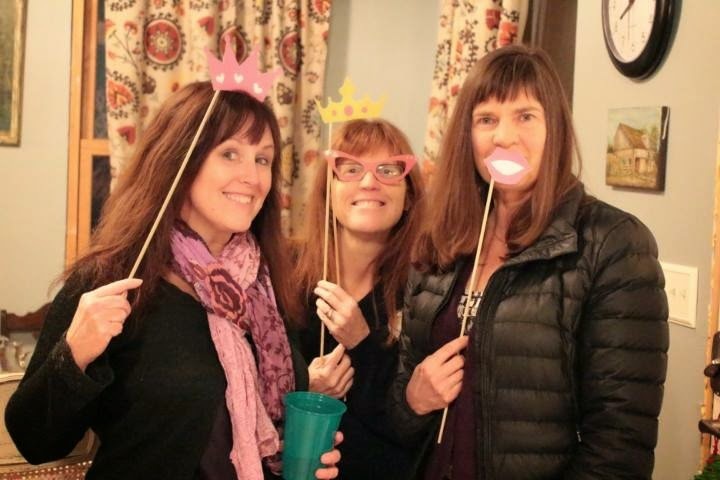 Tracie brought cut outs attached to sticks so that we could do silly pictures. That's Tracie in the middle. She's a librarian and comes up with all kinds of clever ideas. Janine on the right is one of the women who hiked the Appalachian Trail with me. Laura on the left has a son close to Spencer's age. They were best friends for a while, united in their love for basketball. Here's a group picture, a groupie, of a bunch of us just after midnight. Sheila's 16-year-old is photobombing us in the very back. And after the clock struck midnight, we decided we needed to dance. I love the expression on Pam's face, on the right. She looks so sassy. We were waving our fingers at Dan who was taking pictures. All except for Sheila in the back who didn't realize we were posing. 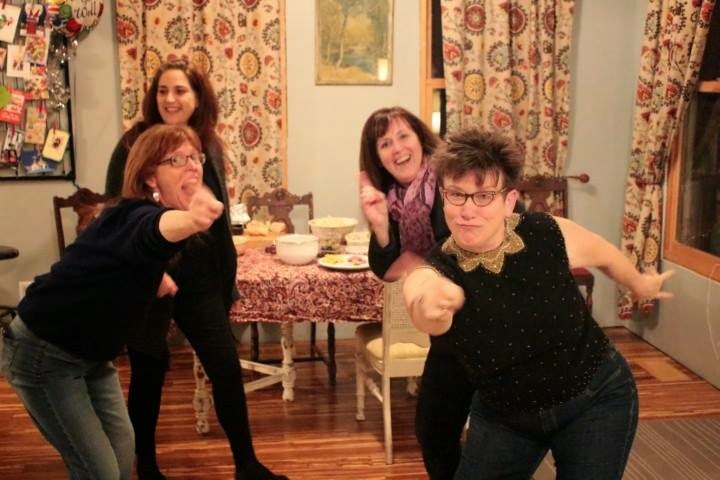 I hope everyone else had a fun-filled New Year's Eve and I hope the coming year is just as filled with laughter and dancing for all of you as I had at Sheila's party. With a new year comes people who talk about resolutions. When it comes to resolutions, I reflected on my circumstances and realized that I'm fairly happy with my life. The things I want to change would require wrapping my children in bubble wrap and ushering them through these tenuous teens and twenties. But I can't do that. I can't change anyone but myself. The only things I want to do are more of the things I'm already doing. It makes me think of the Barbra Streisand song "Everything" from A Star is Born. Does anyone else remember that movie? It was the last movie I remember my sister seeing before she died. She loved it and bought the songbook, so I've had it since then, more than 35 years. Streisand sings about all the things she wants to accomplish -- "I don't want much, I just want more," is one of the lines. So I plan to increase my writing and my running. I hope to travel to Europe again as inspiration for my writing. Sure, there are things I could do to be a better person. I could eat more vegetables or volunteer more. I could vow to blog every day. I could grade papers the day I receive them, but I think I'll just continue on the path of enjoying life that I've begun. To be more aware of the joys all around me. I know not everyone is as fortunate as me, and I need to be more cognizant of that, but I know so many people who have "everything" and they aren't enjoying life. They complain and find misery. I don't want to be that person. Last night, I went to a New Year's party at a friend's house. The beautiful home was filled with decorating touches I could never pull off, but more importantly, my old friends from our years of homeschooling were there too. Amidst margaritas and meatballs, I laughed until I cried, and after midnight struck, we danced and twerked. I hope everyone else has found some joy today as a new year begins.